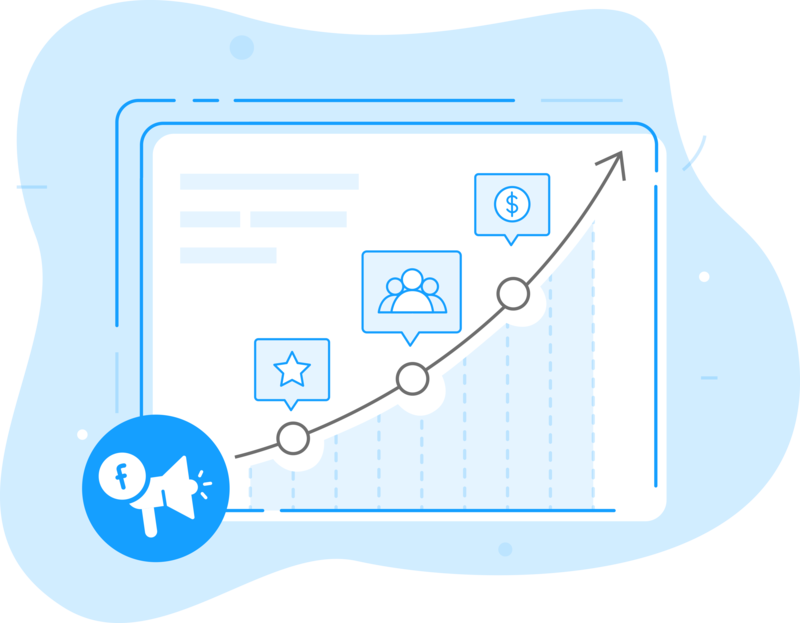 Tap into the expertise of our Facebook advertising experts and proven-to-work strategies to run all of your campaigns end-to-end. Don’t annoy prospects by showing the same retargeting ad over and again. With Retargeting Journeys we take visitors through an engaging sequence of ad experiences, reinforcing your brand, building trust, and educating people after they interacted with the awareness campaign or left your store without completing a purchase. Increase customer retention and LCV by showing ads, quality content, complementary products and cross-sells to previous customers, fans or subscribers. To thank them for their loyalty we typically include special deals and promotions. A good rule of thumb for loyalty campaigns is a 8x ROI by leading with quality content, discounts, and best selling products. Raising awareness is easy. But sharing what makes your brand special in a way that get people to care is something different. In an awareness campaign, we generate targeted leads by sharing your brand's uniqueness, getting the right people further down your funnel as a first attempt to generate leads & sales. If you've ever tried Facebook ads before, you'll understand exactly how complicated they really are - and that doing them wrong will end up costing thousands of dollars. We let entrepreneurs focus on their zone of genius by taking the whole process off their hands. We create all the creative for your ads and use a variety of ad formats such as videos, images, carousel and canvas ads to get results. Our proprietary optimization algorithm analyzes and makes daily tweaks that improve your campaign performance. We test all aspects of your creative, ad formats and targeting to continually improve your ad campaigns. With focus on metrics like CAC and CLV we manage your ad spend to increase your profits. We make sure your Facebook Pixel is set up and working properly to ensure optimal results. I'm just beginning to focus on paid advertising on social media. I need help getting started - but most importantly, I want my campaigns properly set up with low cost per sale and a to see a positive ROI as fast as possible. I currently have campaigns up and running. My current return on investment is not where I'd like it to be. I'm looking for help in managing my account to improve performance and help me cut wasteful advertising dollars. I'm ready to unlock the full potential of paid advertising. I am looking for an agency to optimize my current campaigns with the latest software, technology and advertising techniques to scale up and maximize my advertising potential. Our experts use proven-to-work strategies based on real-time analytics, and detailed research. Everything we create will always be your property. We're confident in what we do, and you're free to leave. We improve performance right away and then continue to maximize your profits based on data and testing.